Last night, the book McCauley, Then & Now launched at Zocalo. The book is designed as a walking guide to the neighbourhood and includes the history of the area, many of its buildings, and stories from long-term current and former residents. The launch featured people from the committee that created the book speaking, reading, and making music. I was the Editor of the project, and spent the evening behind the camera filming the event. Here it is! 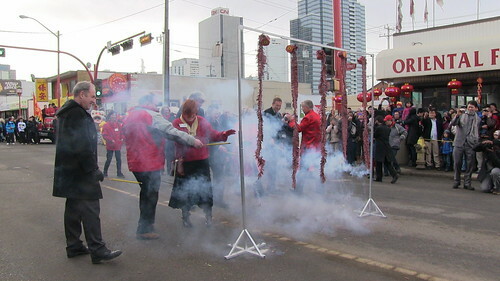 One of my favourite events in the area is the annual Lunar New Year celebrations. 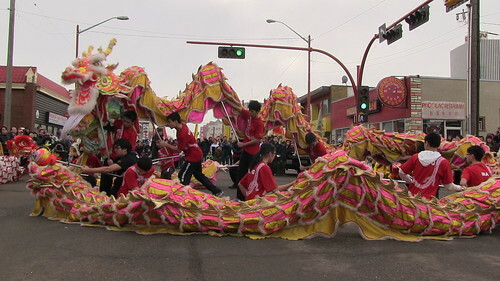 On February 16, the Year of the Serpent was welcomed with various dignitaries bringing greetings, a Dragon Dance, and a Lion Dance. As always, I was made partially deaf by the firecrackers, but I just love the sounds and colours of this ethnic celebration. I also saw the inside of the Hull Block for the first time, and ran into Michael Phair as he was preparing for his role as the “Money God.” Another first was taking a ride in Rickshaw Dave’s rickshaw through a section of Chinatown. Many McCauley residents know Dave and his rickshaw. I filmed my ride – what fun! Here is a look at some photos from today as well as a playlist of videos, including speeches, the Dragon Dance, and Lion Dance. Be sure to watch the volume on your computers – those firecrackers are LOUD!